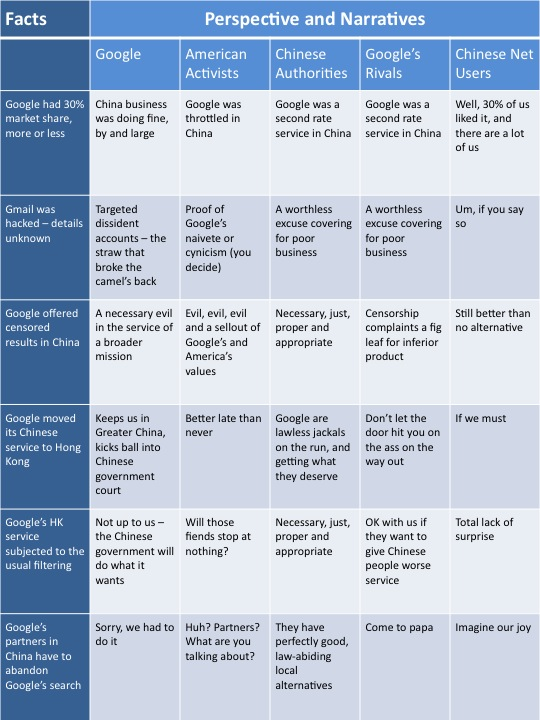 Should Google have been in China? Did they make the right move in pulling out? Will this influence the Chinese government? What does it mean for foreign businesses in China? Are they evil or not? Who knows? Not me. And none of these questions are going to be answered in this post. But stick with me, because that’s the point. The fact is that everyone and their goldfish has an opinion on Google’s fortunes in China, but few people actually know anything conclusive, so what we’re getting is a huge dose of punditry, analysis and opinioneering. This is the kind of thing that PR people live for, because what we’re witnessing first hand is the creation of a narrative. Or, rather, several narratives that serve different worldviews, audiences and points of view. This is PR in action: The effort to influence perception and opinion with regard to an entity or event, generally with the objective of supporting some kind of end-state result (higher sales, a political victory, popular consensus, the launch of a war, etc.). PR people are often accused of being liars. This is a shame, because a good PR person doesn’t lie or make up facts. I’d like to tell you this is because PR people are noble souls who want only the best for the planet and fuzzy puppies, but the real reason is that lying makes you vulnerable and doesn’t usually work very well (and, yes, it’s also wrong). Lies can often be proved false, and this can cause your position to unravel pretty quickly, often with devastating consequences. Even if you string the lie out long enough to achieve a stated objective, you’ll take damage on the backside if your story comes apart. See, for example, weapons of mass destruction and the Iraq war, which claimed the reputations and legacies of many people. But PR people do often try to interpret the facts (or obscure them) in specific in selective ways. In the vernacular, we spin things. In fact, the very term “spin doctor” (sometimes credited to the novelist, Saul Bellow) refers to trying to define the interpretation of events or facts — to determine which way they “spin” in the public sphere. PR people do this for a living. But we’re not the only ones who do it. Anyone with an agenda tries to interpret facts to create a narrative that serves that agenda, or that serves their world view. Often, dueling parties compete to establish the defining narrative of a situation or event. Consider how Democrats and Republicans competed to establish the narrative for health care reform in the interest of divergent political objectives. The media and public spheres of discussion are thus, often, noisy and squawky collections of competing narratives interpreted or distorted from the same basic set of facts in order to serve different agendas. Sometimes it takes a long time for a “definitive” narrative to emerge. Sometimes a definitive narrative never emerges, or different audiences arrive at divergent narratives because they’re exposed to different influences (anyone who looks at how Chinese and Western audiences fail to see eye-to-eye on many issues will be familiar with this). This is essentially what has been happening with Google over the past few weeks, as people have competed to establish different narratives regarding its withdrawal from China. There has been a huge amount written and said about Google’s predicament and options in both the Chinese and Western media and blogospheres. At last count I had 27 articles bookmarked since the announcement that Google would shift it’s Chinese search operation to Hong Kong. And there were plenty that I didn’t bother to bookmark. Well, that’s just too much damned stuff to analyze, and I am way too lazy to pore through it with a notebook and try to draw any meaningful conclusions about what it all means (hey, I don’t get paid for this). Also, my overwhelming impression is that there is so far roughly zero consensus on what it all means. I realize this is a vast oversimplification and there are no doubt various interests omitted, but this captures most of the main parties and facts. What’s not included here is any kind of conclusion of each narrative. In my opinion, the story is still unfolding and its too early for that. But we’ll see how things go over the next few weeks. The other thing is that these narratives aren’t in equal competition. To use a possibly inappropriate military metaphor, there are different theaters of operation in which the stakeholder have varying levels of influence. So, in the US, Google and the activist (and analyst) community are the loudest voices. in China, the Chinese government has the tools to define the public narrative, and has been using them liberally, although there is some ferment in the margins (also here). Eventually, there will be a canonical version of Google’s misadventures in China. or at least one canonical version in the West and one in China. These may not be the creation of a single group. One group might control interpretation of one element of the story, and one group control another. But for the moment, the fun is in watching the battle to own the story. Enjoy it while it lasts. Finally, from a PR perspective, there is possibly one overarching lesson that can be drawn from this whole situation. I can’t take credit for this insight, it comes from Craig Adams, a colleague of mine. But it’s deceptively straightforward and I agree with it wholeheartedly. He said that if you have to sell out your basic principles to do business in China, that’s a pretty good sign you should reconsider your plans. This entry was posted in Uncategorized and tagged Business, Censorship, China, China in the News, Crisis Management, Google, Internet, Media, Propaganda, Public Relations, Technology. Bookmark the permalink.